Blurb: The penultimate chapter in the sophomore album from Celldweller, giving the audience one final tease before the conclusion. One might think that releasing an album piecemeal – a few tracks at a time – might be counterproductive to the experience of listening to the full breadth of a musician’s artistic expression. However, since releasing the first chapter to Wish Upon a Blackstar in 2009, Klayton has maintained and even heightened interest in the sophomore Celldweller album with a steady output that shows not only the development of the album but of his own musical prowess. With Chapter 04, audiences are treated to yet two more tracks of hard-hitting industrialized electronic mayhem as only Celldweller can deliver. Beginning with “I Can’t Wait,” a track whose title reflects the sentiment of many a fan anxious for the completion of Wish Upon a Blackstar, Klayton launches full throttle into a menacing display of drum & bass and industrial metal as frantic beat structures and warbling synth sequences underscore his always proficient vocal harmonies. 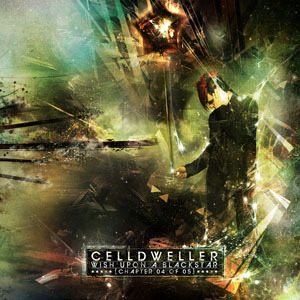 In true Celldweller fashion, the song demonstrates a progressive compositional mentality moving through unorthodox chord progressions and arrangements that have helped this artist to stand above the plethora of industrial rock and hard electro. In contrast, “Gift for You” slows the pace considerably as sensual female vocals, twinkling synthesized ambience, and a sparse, shimmering guitar line play against a squirming bass that hints at a drum & bass explosion that never comes, keeping the listener on edge but always attentive. As a piece of somber dubstep, the song is impressive again for Klayton’s vocals as layers of harmonies filtered through vocoders and various other effects add to the song’s lush atmosphere. The coda is particularly interesting as the track glitches and fades into a veritable electrified space that almost bears the hallmarks of what would normally be a guitar or keyboard solo. As with all the past chapters, Chapter 04 comes with instrumental versions of the two tracks, while the deluxe edition contains commentary tracks and Beta Cession demos. Interestingly enough, the energy of these two tracks – one fast and aggressive, the other slow and ambient, both introspective and expansive – moves with such fervor that despite their individual lengths, they move at a seemingly breakneck speed. With the fifth and final chapter to Wish Upon a Blackstar to follow, “I Can’t Wait” is an appropriate teaser track as Klayton promises the next release will contain even more material than is presented on any of the past chapters. As ever, the production on Chapter 04 is topnotch, rivaling the most widely renowned and respected producers in the industry, while the musicianship is simply above the standard industrial/electronic fare. One more chapter to go before Wish Upon a Blackstar reaches completion, concluding this phase of Celldweller’s original odyssey of performance, distribution, and production that the world of music has yet to match.